A tropical wonder tree, popular in India and Pakistan. Grows to 50 ft (16m), likes warmth. Can grow indoors in very large pots, 10 gallon minimum. All parts are used -seeds, leaves, flowers, bark. Tea is made from leaves and branches for clearing skin problems, controlling high blood pressure, cleaning the blood, contains substances used as spermicides, fungicides, anti-viral. Used against malaria. Branches are chewed to clean teeth. Helps keep insects away. Leaves placed in closets and cupboards keeps clothes from being moth eaten. Antibacterial successfully used against staphylococcus and salmonella. Neem oil is very popular for head lice and psoriasis. Pain reliever, anti-inflammatory. Fruits are used for urinary diseases, piles, intestinal worms, leprosy. Tea is bitter but very popular for health qualities. Tender shoots and flowers are eaten as a vegetable. Some of the things neem is used for are- wounds, burns, sprains, bruises, earache, headache, fever, sore throat, food poisoning, shingles, colds, flu, hepatitis, mononucleosis, fungal infections, yeast infections, sexually transmitted diseases, acne, skin diseases, heart diseases, blood disorders, kidney problems, digestive problems, ulcers, periodontal diseases, nerve disorders, malaria, fatigue, and a host of others. It is being closely studied for use in battling AIDS, cancer, diabetes, allergies, and as birth control for both men and women. Because Neem is so strong, it’s recommended to take for 2 weeks, then not for one week, then 2 weeks etc. Some highly compatible strains of Beauveria bassiana with the different sources of neem, Azadirachta indica. Control of Wet Rot Disease of Amaranthus species caused by Choanephora cucurbitarium with extract of Azadirachta indica. Hepatoprotective activity of methanolic and aqueous extracts of Azadirachta indica leaves. In particular Azadirachta indica (neem tree) leaves are used for pest management. 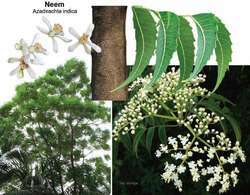 Evolution of some insecticidal combination and neem, Azadirachta indica (A. All farmers (100%) reported Albizia coriaria, Azadirachta indica, Calliandra calothyrsus, F.
A: The primary ingredient in Lice-Nil, neem extract, is a vegetable oil pressed from the seeds and fruits of the Azadirachta indica tree. Efficacy of botanical formulations from Annona squamosa Linn, and Azadirachta indica A. Dairy cattle tick (Boophilus microplus) control with Azadirachta indica A.